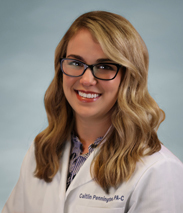 Caitlin Pennington attended the University of Kentucky where she majored in Dietetics. She completed her Master’s of Physician Assistant Studies at the University of Kentucky in 2012. She is a member of the American Academy of Physician Assistants and the Society of Dermatology Physician Assistants. She is a native of Lexington, Kentucky, and currently lives in Lexington with her husband and two daughters.